Our Bathroom Makeover Reveal PLUS How You Can *WIN*!!! Moving into our spacious art deco apartment 4 years ago, we never imaged it would be transformed it into something we love as much as we do today. I’m not going to lie, it was a bit of a horror show when we got the keys and my hubs and I wondered for a couple of night afterwards whether we had made a big mistake buying a place that needed so much work. But I think deep down I always knew we would turn it into something beautiful, something special that would reflect us and resonate with our style and personality. And that it certainly does. It’s become a lovely space (Albeit a bit small now with three kids) we enjoy hosting friends and spending time as a family. As a young couple with two kids at the time, living on one salary and with no help from mommy and daddy, we bought our first little home rather reluctantly, knowing budgets were tight and that our dream of renovating it to perfection straight away was simply not an option. I had to accept that it would be months before we would renovate our old 70’s style kitchen. (And no not 70’s in the cool retro sense!) It would be a little wait before we could invest all the love and care we so desperately wanted to into our new home. But we began ticking things off our list one room/nook/entrance hall/kitchen/bathroom at a time and eventually all the big renovations were complete. Over the last four years we have so enjoyed the process of making our house a home, slowly filling our walls and shelves with things and pieces we love. From buying prints to having some art work custom made to putting up shelves and sourcing great furniture pieces, we have worked hard to slowly, over time invest into our home and make it a place we cherish. Gosh, I look back some days and feel so proud of how much we have done and how, even though we took longer than most people we worked hard to create a space we love. But the one part of our home we had yet to invest any time and money in, has been our bathrooms. While it was renovated soon after we moved in, we never put up any shelves or pictures and its always really been more about function than style. With the two makeovers of the Boys room, our Master bedroom and even a beautiful Nursery space we created for Hunter, I started to feel like our bathrooms were looking somewhat neglected and could use a little spruce up! I started to feel excitement build in my tummy as I felt the familiar stirrings of another project come to life. It’s become such a passion and something I invest so much of my soul into, each and every time. The one thing I regret about our bathrooms, was the tile we chose for the wall. I love our showers, bath and floor tile but in hindsight I should have gone with a simple subway tile around the bath and kept the rest plain. Anyway, my husband would shoot me if he heard me complaining so best we keep that between you and me. I wanted to create a space that was fresh and with lots of natural weave and woods coming through but also touches of black and green from plants. I really wanted to find some beautiful lighting as all we had was an exposed glass globe bulging from our ceiling. (Again not the cool type of exposed, the more old 80’s one that looks like a think pair of thick glasses.) We simply never bought new lighting for our bathroom when we first moved in, because well, budgets were better spent at that point on things that we actually needed. I wanted to find a beautiful black pendent light that would hang low from our high ceilings and pick up on all the other bits of black in the room. And I just so happened to find the perfect one from Vox Furniture! If there is a theme to our new improved bathrooms I guess you could call it Botanical meets Natural Scandinavian. I mean let’s face it, have I ever been good at sticking to the rules with these sorts of things? I think it’s so important to put your own signature touch on a space and come up with something unique. While I love finding inspiration on magazines and on Pinterest, I hate feeling confined and that you can’t have free-reigh with incorporating different styles. At the same time, It is important to have a common thread running through your choice of decor and design and finding ways to help it all sync and morph well together. So without further ado, here are the incredible brands that have once again partnered with me to make this beautiful bathroom a reality. *Some products were generously sponsored and some products I have purchased myself. KNUS with a beautiful range of products : Beautiful art prints by Ingrid Hall, a liquorice floor basket (ideal for rolled up towels or laundry) and a Dhurrie Tabby bath mat. Also featured from KNUS is their matching pot plant holder. Vox Furniture with their beautiful Brine Pendant Lamp, featured in both bathrooms. Ashanti with a selection of their authentic and woven trays and baskets. That Little Shop with their bespoke Turksh towels. Linen House with their selection of luxury bath towels as well as a marble tumbler and soap dispenser. Simply Child with their stunning Wall ladder, perfect for towels in the bathroom or blankets and throws in any other area in your home. Cape Island with a selection of their luxury bathroom products inspired by the natural beauty of Southern Africa. Like with all the other rooms in our home we created in a feature wall in both bathrooms. I love how a dark grey (liquorice) wall adds some depth and character to a room and how it literally makes anything you put against it POP! In my opinion it’s the most effective way to make a big difference to a room using very little money! The pictures were all sourced from KNUS by artist Ingrid Hall and the shelves I bought from @Home. I love the industrial design of the shelves and the black metal feature just tied in so beautifully with all the other black elements : the Pendant light from Vox, the pictures frames and other bits of black detail. Beside that we simply added some plants in gorgeous baskets, some woven storage trays, new towels, a bath rug and a few other bits and bob to bring our drab old bathroom to life. ⇑ Hairpin plant stand from Design Store, the perfect addition to any nook or corner in your home. ⇑ Featured above: Towels from Linen House. 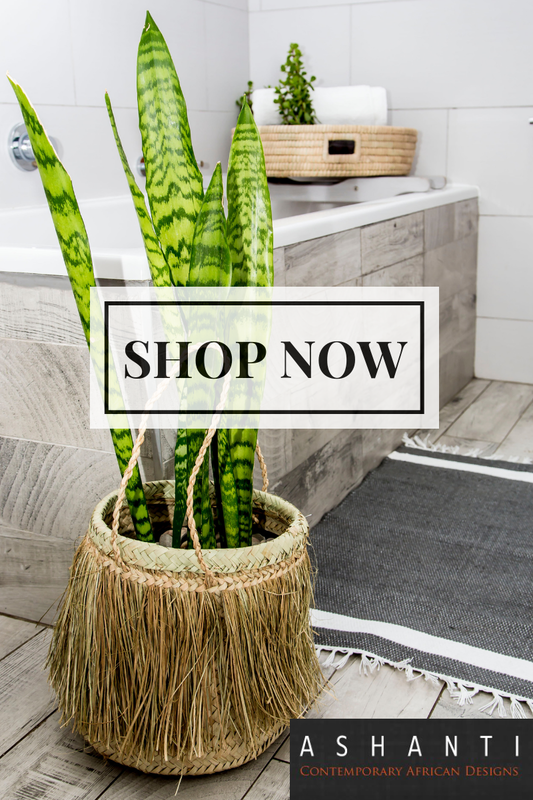 ⇑ Featured above: Wall Ladder from Simply Child, Turkish towels from That Little Shop, DHURRIE TABBY BATH MAT from Knus and Woven basket from Ashanti. ⇑ We don’t have blinds in our bathrooms, kitchen or lounge. We live on the first floor but it’s actually more like the second floor with a huge store room beneath us, so we are too high up for people to see directly inside. I’ve always loved that we have been able to keep the space around our windows open, especially in the lounge where we get more light and you get to see the beautiful arched windows in all their glory. I wanted to find a cute way to “dress” the window in the bathroom and kitchen without the use of conventional blinds. As a plant lover, the solution was simple : A vine/plant curtain!! I plan on doing this in a more detailed/dense way our kitchen! ⇑ Featured above: This shelf I found at @Home, which I thought was a perfect size. I love how the wood contrasts with the metal giving it an industrial feel. The picture and frame I bought off Gumtree for only R50, proving it to be a great way to source things to spruce up your space. Remember you don’t always have to buy new, someone’s “trash” could very well be your TREASURE!! We haven’t invested in new towels since we got married! It’s shameful really when you hear we have have been married for 12 years! I don’t know what took me this long to throw all our old towels out and get new ones that look beautiful and feel even better!! These luxury cotton Selene towels from Linen House featured above are just perfect and I simply adore the charcoal and white colour combination, fresh and trendy at the same time! ⇑ Featured above: Liquorice floor basket from KNUS. Turkish Towel from That Little Shop. Basket from Ashanti: Their signature Ashanti fabric is hand-woven from the fibres of perfectly good fabric that would otherwise be sent to landfill. ⇑ Featured above: This exquisite range of Bathroom products from Cape Island will have you inhaling their beautiful scent every chance you get. I have never enjoyed the smell of our bathroom more thanks to our gorgeous diffuser. ♥ Featured here: CONSTANTIA HEIGHTS 150ML diffuser, liquid soap, hand lotion and candle. Also featured : a beautiful woven tray from Ashanti, perfect for bathroom products, towels or used on a display shelf anywhere in your home. ⇑ Featured here: LIQUORICE PLANTER BASKET from KNUS. ⇑ Featured above: Beautiful marble soap dispenser and tumbler set from Linen House. Light by Vox Furniture and Artwork by Ingrid Hall, available at KNUS. ⇑ Featured above: I simply love a wall ladder in any area of the home!They are perfect in a lounge during winter with chunky blankets draped over them, in a bedroom with throws hung over them or in a bathroom, adorned with fresh towels! This one from Simply Child is my all time favourite and we love how it has added something fun and quirky to our bathroom space. 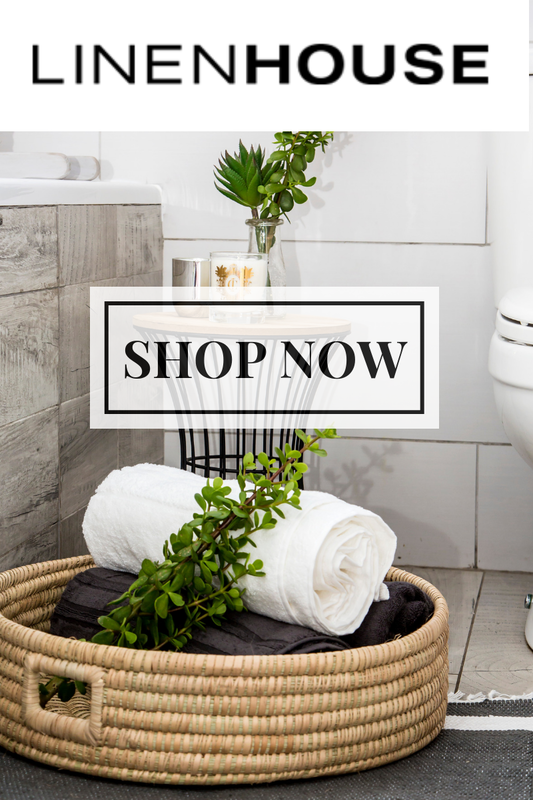 Also featured : Basket from Ashanti, Floor mat form KNUS, Cotton towels from Linen House and Turkish Towel from That Little Shop. ⇑ Basket and tray from Ashanti. Floor rug from KNUS. And there you have it…. What do you guys think? I really wanted to show you how you don’t need much at all to spruce up a bathroom space. You can make do with what you have as a shell and add dimension, colour and flavour in so many other ways. Even if you start small by buying one beautiful product a month, you will slowly be adding to value to your bathroom and turn it in to something you love. And what better way to do that than by supporting our local brands and craftsmen. Please always take careful consideration when buying something and remember that you pay for quality. There’s a reason something is often a bit more pricey : it’s more durable, made with better materials and will last you fro the rest of your life if you treat it well! On Friday I will be launching phase TWO of this campaign : a chance for you WIN a bathroom mini- makeover worth R8.500!! Here’s what you could win! Thank you to all my vey sponsors who have come on board with me again. I am your number fan and have loved working with you! Oh Wow! I’m almost Green with Envy – our bathrooms are GROSS; think old green and link bathrooms and toilets that match. We have never had the money and don’t know if we ever will to update our bathrooms as they are so small we cannot see how we’d be able to update. Our house is over 30 years old and along with it comes so many maintenance issues I can’t begin to tell you. I would be in heaven IF I had such BEAUTIFUL spaces where I could unwind – candles a glass or two of wine. I can’t do bubbles as anything other than Sunlight baby soap is all I can use as I have Psoriasis. Leigh you have amazing taste and style – you should really do consulting work for interior design! I’m excited for your competition – we’re moving 1 December and flip the only thing I’m worried about is our new bathroom. It’s not pretty at all! I love what you did with the bathroom window! I too don’t have blinds or curtains in my bathroom windows and have been wondering what I can do to make it look nice. Can I ask where did you purchase that curtain rail from? I’m definitely going to try my hand at the vine curtain. It’s truly beautiful Leigh.Makes me wish k could speed up my own process of renovating. You are so talented in taking simple things to shushzzz things up. Love the use of plants. I think I’ll steal that idea. Our bathrooms aren’t as big and they’re a real area of concern for me. Cost is always an issue but small changes need to and can be made. Thank you for reminding for bringing it into focus for me. Bathrooms and boys!! Always an area of concern in our home. I look forward to having something pretty. Very nice makeover. You did well. I love the marble goodies and the baskets are really fun. And it all ties together beautifully.